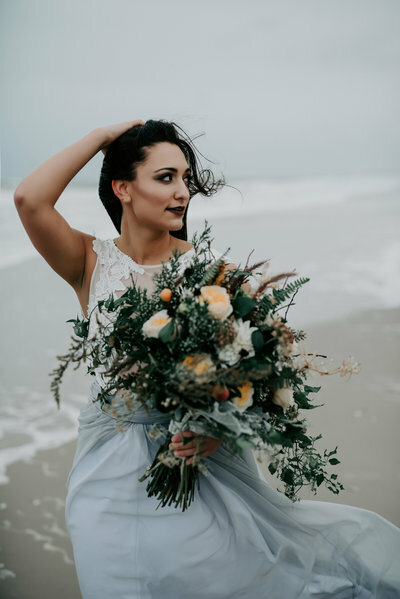 This Philadelphia Wedding inspiration was the highlight of my winter! Moulin, located in East Falls, is a fabulous new Philly wedding venue! It’s chic, warehouse vibe was the ultimate blank canvas for our styled shoot. It was a truly a dream team effort on this one! My friend Meghan from House of Catherine collaborated with the catering team behind Moulin, Brulee Catering and the amazing Sara Rea Design to bring this “outdoors indoors” vision to life. One of the biggest 2018 trends is hanging table decor (that you might have seen on this post by June Bug Weddings and there was plenty of that trend in this shoot! Fresh Designs Florist provided the gorgeous floral design, which transformed this indoor space into an outdoor fantasy! Greenery and jasmine dripped from the branches and twigs that supported this unique table design. Also featured is the amazing acrylic signage design created by Meghan of House of Catherine. My favorite hair and make-up team, Ariel Katrina Hair and Emily Dimant had model Sydney looking flawless for this shoot. She rocked a two different wedding gowns by Lovely Bride. For the amazing desserts, Crust Vegan Bakery designed the cake and Little Baby’s Ice Cream provided the tabletop experience. The Fox and the Finch provided the luxe vintage furniture. Entertainment powerhouse, East Coast Entertainment provided the DJ for dancing! If you are planning an amazing Philadelphia wedding, definitely check out Moulin (and these amazing vendors) immediately! Ready for us to capture your Philadelphia Wedding? Click here!